Secrecy has surrounded the event staged by the communist country and attended by firms including Boeing and Lockheed Martin. It coincides with the biggest arms buildup in the country since the Vietnam War. There has been no mention in state-controlled media and defense reporters are not covering the forum. Efforts by Reuters to gain permission to attend have been unsuccessful and Vietnam’s defense ministry could not be reached for comment. Vietnam has accelerated efforts to build a military deterrent and is the world’s eighth-largest weapons importer, as neighbor China intensifies its push to fortify South China Sea islands it has either occupied or built from scratch. According to the Stockholm International Peace Research Institute think tank, which tracks defense trade over five-year periods, Vietnam’s total arms imports during 2011-2015 represented a 699 percent jump from 2006-2010. The Hanoi symposium comes amid debate within the U.S. administration over whether to respond to Vietnam’s longstanding request to remove an arms embargo that is one of the last major vestiges of the Vietnam War era. Washington eased the embargo in late 2014, but has said any decision to lift it completely would hinge on the extent to which Vietnam has demonstrated progress in improving its human rights record. Its top envoy in that field, Tom Malinowski, was in Hanoi earlier this week. Vietnam has been in talks with Western and U.S. arms manufacturers for several years now to boost its fleets of fighter jets, helicopters and maritime patrol aircraft, although Russia, its traditional supplier, maintains a dominant position. Industry sources say Hanoi is keen on U.S. weapons yet wary of the threat of a future embargo even if the current one ends. The countries do have a common concern in China, however, whose assertiveness in the South China Sea has alarmed Washington. Obama is due to start his Vietnam visit on May 22, the first by a U.S. president in a decade, underlining the rapidly warming relationship between the countries at a time of testy ties and growing mistrust between Hanoi and Beijing, which have competing claims to the Paracel and Spratly islands. A spokesman for Lockheed Martin confirmed the company was attending the Hanoi event. Boeing is also attending, although the firm made it clear it was not in contravention of the embargo. “I would like to point out that any defense-related sales to Vietnam will follow development of U.S. government policy on Vietnam,” a spokesman said. Those needs have included the purchase of six modern Kilo-class submarines from Russia equipped with Klub cruise missiles, Russian-built S-300 surface-to-air missile batteries, and, from Israel, Galil assault rifles and AD-STAR 2888 radars. Its navy is making Tarantul-class corvettes, known as Molniyas, modeled on Russian designs and equipped with 16 missiles with a range of 130 kilometers (80 miles). 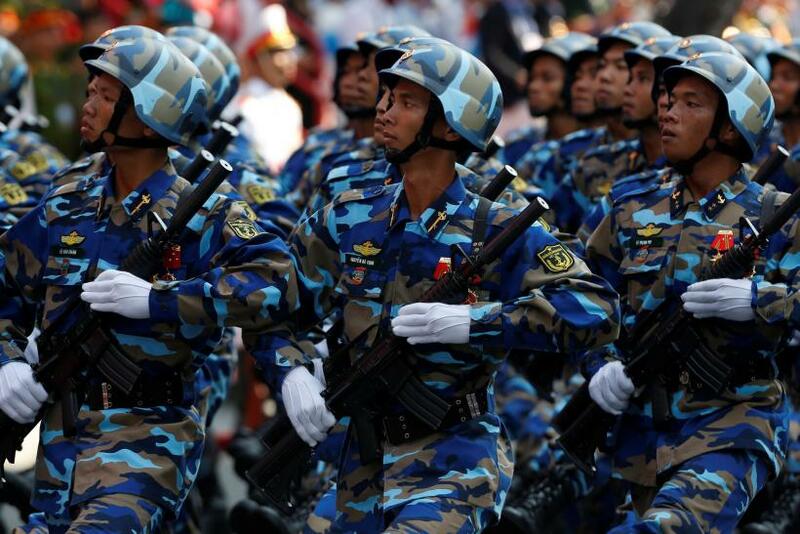 Though the communist parties that run China and Vietnam officially have brotherly ties, experts say Beijing’s brinkmanship has forced Vietnam to recalibrate its defense strategy. Its outreach so far has been weighted toward Russia, India and Israel in procurements, but analysts say it is unlikely to seek formal military alliances and would stick to its foreign policy of not relying on a single power. It has, however, mulled joint exercises with another South China Sea claimant at odds with China, the Philippines, and has received recent visits by Singaporean and Japanese warships at its new international port at Cam Ranh Bay, a strategic deepwater base that is home to its submarines. Tim Huxley, a regional security expert at the International Institute for Strategic Studies in Singapore, said Vietnam’s interest in getting the arms embargo lifted was not only about access to U.S. technology, but boosting its bargaining power. “It reflects concern about what’s happening in the South China Sea and its need to restructure and re-arm, with a greater emphasis on greater naval and air capability,” he said.